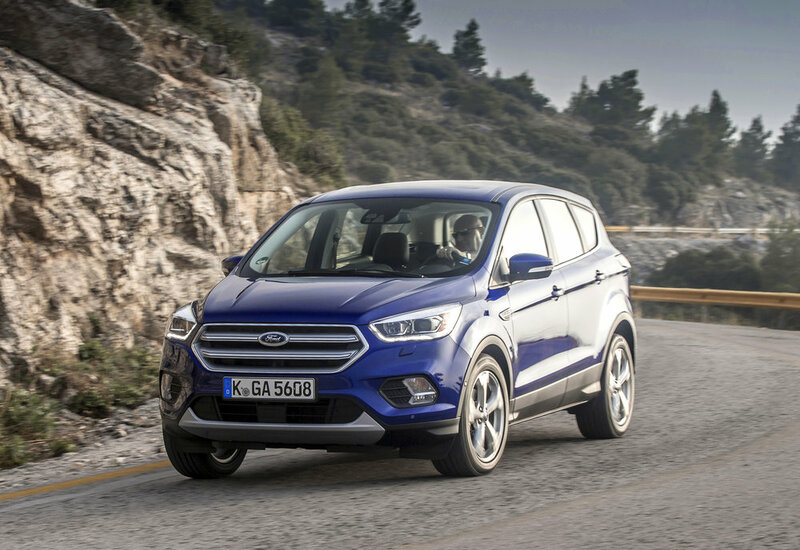 The facelifted Ford Kuga gets a new trapezoidal grille and restyled headlights with new LED daytime running lights. The new Kuga offers Ford’s SYNC 3 communications and entertainment system, innovative driver assistance technologies, a restyled interior, as well as 'powerful and efficient' engines including Ford’s 120PS 1.5-litre TDCi diesel that returns 64.2 mpg and 115g/km CO2. Perpendicular Parking technology also features on the revamped Kuga - that helps drivers park hands‑free in spaces alongside other cars - and is joined by an enhanced version of the Active City Stop collision avoidance system and Adaptive Front Lighting System for optimised visibility in low light. Further advanced technologies include a Hands-Free Liftgate and Ford's All Wheel Drive (AWD). The new Kuga features Ford's latest SUV design language, which is shared with the EcoSport and the Edge. A large upper trapezoidal grille and a smaller lower grille are flanked by new headlamps incorporating LED daytime running lights and complemented by fog lamps. Restyled taillights complete the look, while a new range of 17-, 18- and 19-inch alloy wheel designs also are available in variety of finishes including Luster Nickel. A power-operated retractable tow bar automatically stores itself out of sight below the rear bumper when not in use. The interior has been refined to offer a 'more ergonomic, stylish and comfortable experience' for occupants, says Ford. The steering wheel and air-conditioning controls are more intuitive, and feature fewer and more easily distinguishable buttons and switches. The steering wheel is also offered with heated leather to improve comfort in cold weather, while all automatic model will feature paddle-shift controls that enable drivers to manually select gears while keeping their hands on the wheel. Power will come from TDCi diesel and EcoBoost petrol engines. The 120PS 1.5-litre TDCi diesel delivers 64.2 mpg and 115g/km CO2 while a 180PS 2.0-litre TDCi 6-speed manual AWD offers 54.3 mpg and 135g/km CO2 and a 6-speed PowerShift AWD returns 54.3 mpg and 134g/km CO2. EcoBoost petrol engine options include the 120PS and 150PS 1.5-litre EcoBoost 6-speed manual FWD offering 44.8 mpg and 145g/km CO2 and a 182PS 1.5-litre EcoBoost 6-speed automatic AWD with 37.7 mpg and 173g/km CO2.